It’s no longer enough, actually. Modern technology keeps evolving at a rapid rate, and ‘this is how we do things’ is no longer an effective strategy for customer service, whatever your business is. Today’s online consumers are changing quickly, as well as their expectations and preferences. And to keep up with the pace, your people need best tools at their disposal. How about taking the next step and investing in an innovative tool to make your team more efficient and effective? If you are still questioning yourself “Should I get Live Chat for my business?”, this is an article that might help you out. We’ve pulled together 7 signs your team really needs Live Chat. Look to these indicators to figure out how you can improve your performance with Live Chat. Low customer satisfaction rate is an alarming sign for any business. It can be caused by a number of reasons but the list is topped by these two: contacting customer support takes too much time or requires too much effort. Long delays, automated systems and dreaded ‘hold’ music hurt the chances, don’t they? According to the Customer Service Benchmark Report released by eDigitalResearch in July 2015, less than half of consumers (45%) said they were satisfied with phone as a touch point, with only 26% of which found this method easy to use. The report also highlights Live Chat as the touch point scoring the highest customer satisfaction rate (73%) of all channels, due to its ready availability and ease of use. Let’s face the fact: email FCR is reported to be the lowest of all channels nowadays. The challenge faced by support agents when handling email requests is all about need for more information. Usually, information provided in initial customer email is not enough to resolve the issue through a single email message, so in most cases they have to get back to customers with a request for additional details like account name, order number, etc. If the interaction was held in real time, getting all this information would not take that much, so adding Live Chat to your website can really help resolve the problem and reduce the number of email correspondence. There are many people indeed who hate having to call someone. For various reasons: they might dislike to be put on hold, or hate the transfers, or simply feel uncomfortable with the need to allocate the time and a quiet space to make a call. Forrester data reveals that Generations Z and X prefer communicating in Live Chat with a live person rather than speaking on the telephone, as talking by typing is the preferred method of communication for the greater part of the younger audience. As your business grows, so do your service costs. The more customers and prospects are contacting your team, the more people you need to handle customer interactions. And one day you start questioning yourself if there is any way to manage the resources more efficiently. The cost of a single Live Chat interaction is one of the cheapest compared to other customer support channels. Gartner found that Live Chat costs just about 1/4th that of a phone transaction, while Forrester provided the figures of $10 per Live Chat session against $33 per phone service transaction. In addition, a single agent can manage multiple chat sessions at the same time. This means that less manpower is required to provide Live Chat assistance. One of the most significant benefits of Live Chat is that you can collect and analyze data about your website traffic — and use this information to communicate with customers more effectively. In most cases when a website visitor calls your Live Chat you have them on your website. Real-time traffic monitoring combined with analytics can be used to benefit your Customer Support team in a number of ways, giving you great insights into your customer service and marketing planning. It lets you connect the initial request with lots of information available about the customer, such as where they come from and how they are using your website so that you can work out better ways to approach them and establish a business relationship. A recent Forrester Customer Service study states that over half (53%) of US online adults will abandon their online purchase if they cannot find a quick answer to their questions right on the spot. In fact, unanswered concerns, complications, and confusion at checkout are one of the major reasons customers abandon their online shopping carts. When confused customers get instant help exactly when they need it, the chances they will successfully complete their purchase are higher. Live Chat support allows a business to provide real-time assistance to customers, answer their questions and concerns during the sales process, which leads to increased conversions and sales. The growing demand for proactive customer engagement is one of the top trends for customer service in 2016, according to Forrester. Are you looking for professional ways to make the shift to a more engaging customer support? 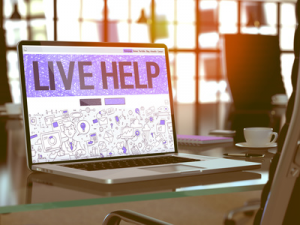 Proactive Live Chat is successfully used on many websites to offer finely-targeted assistance to the visitors when they really need it, making sales and customer service processes vastly more user-friendly and productive. For instance, a chat invitation can be triggered when a visitor spends too much time on a checkout page or a specific website section with complex information about a product. E-TAILING GROUP data shows that using Proactive Chat yields very good results with 65% pollees showing receptiveness of invitations sent through Proactive Chat. If you would like to find out more on Proactive Chat implementation and strategies you may read our blog article on proactive chat here. If you do recognize some of these signs in your own business, implementing Live Chat support as another customer service channel might be the right solution. In case you are already using Live Chat on your website, please tell us about your experience. We would love to hear from you. This entry was posted in Articles, Best Practice, Tips and Tricks and tagged Live Chat benefits, Live Chat support. Bookmark the permalink. Thanks for this post. Online businesses nowadays definitely need real time customer service and LiveChat is the easiest way of doing that. Email is slow, phone takes time and if very inefficient. Have you tried providing the link to someone over the phone? Thanks for this post. The future of the operations and business concerned with customer service greatly relies on the chat answering service. Moreover, with an increase in the business activities undertaken on a cross-border basis, many businesses have been benefited with this service in order to trade overseas. I believe every company that need to retain customers and convert new visitors into sales must take advantage of live chat support on website. Thankfully, all chat software websites provide live chat support. I think 2017 is going to be a good year for live chat as now businesses are realizing importance to converting visitors into sales. Excellent article really are simple things that we need to attend to the new service needs, thanks for sharing! Thanks Julia Lewis, for the wonderful article. Reading this now I believe it may be because of the delay in the response that I have not had results, I never looked at the user experience. Hello, we are a company that serves many real customers and all come through our website on the net. I really liked this article that talks about this new trend of customer service in real time, I think if it is to help with certainty the application is very useful, we are totally adept at this new technology! We have used this feature and found our customers are more eager to contact us live. Best feature for those who want to take customer relationship to next level. Live Chat is a must have feature for any website now a days. It provides great user experience and people love it. Hey julia , great article thanks dear , all points are informative and enhance the customer experience..!!! Thanks Julia Lewis, Live chat reduces overall contact center costs by lowering average interaction costs. Great article,live chat is a great tool for businesses to have. It provides some quick results and reduces frustration through an automated system. Live Chat is must to grow and get closer to your customers. Thankfully, all chat software websites provide live chat support.